The boxer was developed in Munich, Germany towards the end of the 19th century. 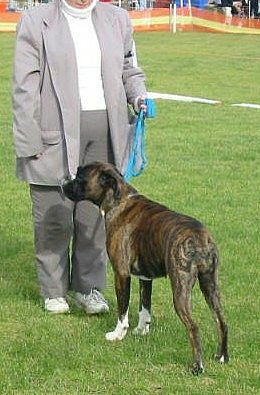 The boxer represents a cross between the Boxer's ancestors of two German mastiff type dogs being the Bullenbeiszer and the Barenbeiszer. 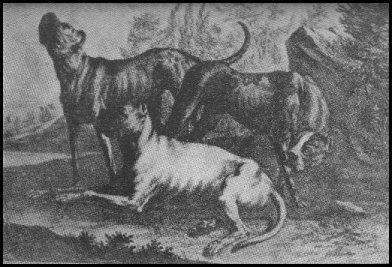 The original Bullenbeissers job was to seize game driven by the tracking hounds and hold onto the game until the hunter came. The Bullenbeissers had a big of mouth with a broad bite to hold the game tightly. The shortened muzzle and undercut jaw allowed the dog to breath while maintaining his grip indefinitely. This underbite is an integral feature in the Boxer of today as well. Early on, these dogs were prized for hunting, bull baiting, and for pulling carts. Later the breed was crossed with a Bulldog. In the later half of the 1800's, the breeding of pedigreed Boxers began. Until then the Bullenbeisser did not represent a uniform or standard dog type. Many were mongrels or were cross bred with bulldogs. The name of "Boxer" finally made its appearance between 1860 and 1870. Some proponents of Boxer line breeding founded the first Boxer Club in Munich, Germany, in 1895. 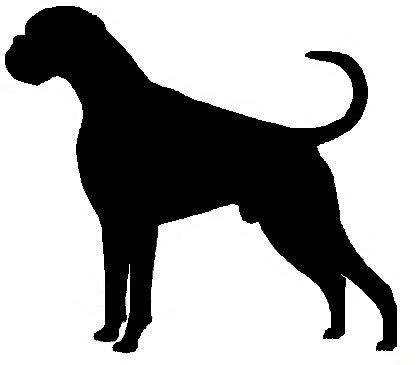 The breed was first registered in Germany, in 1904. It was these dog enthusiasts that made the Boxer into one of the most popular German family pets of that time. It is said that because one of the breed's progenitors was a white Bulldog. Occasional all-white puppy appears in a litter of otherwise correctly coloured puppies. 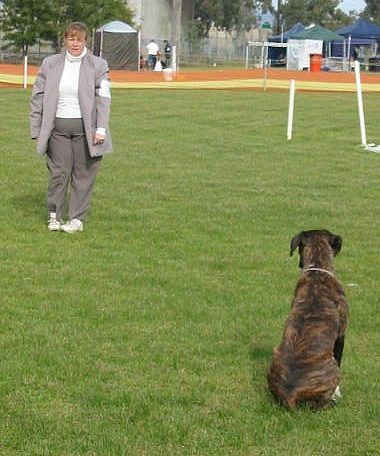 The Boxer was developed to work as a security dog. Therefore the white-coloured dogs were considered completely unacceptable. For a time in Germany tried to develop an all-black Boxer but results were indifferent. Today the only allowable colours, for show purposes, are fawn and brindle. The origin of the Boxer's name is uncertain. Some say it comes from the English word "to box" because of the dog's habit of playfully using its forepaws like the hands of a professional boxer. In the early 1900's a few Boxers were brought to Britain. Later, after World War I, soldiers brought many of the attractive Bulldogs home to Canada and United States. Breeding kennels in North America were established by World War II. A boxer kennel to first make a name for itself, was von Dom. The owner, Friderun Stockmann, laid the basis for a Boxer strain that is still universally respected. From that came the legendary Lustig vom Dom and many of today's Boxers being descended from this stud. The most influential stud dog of all time is said to be Ch. Sigurd von Dom, imported from Germany by Barmere kennels. 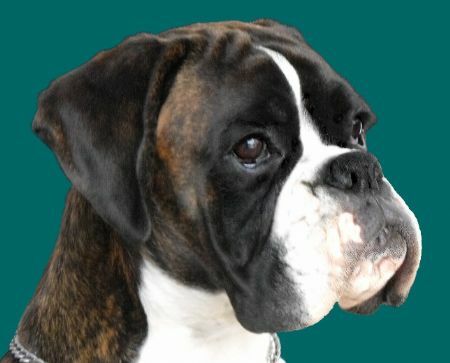 The modern day Boxer is a cross of the following breeds: Danziger Bullenbeisser, Brabenter, British Bulldog, Schneizers, Great Danes, Bull Terriers. A book written by Delinger...is an interesing read. The first Boxer was registered in United States in 1904. Sieger Dampf vom Dom was famous for the first U.S. champion in 1915. The Boxer's popularity grew tremendously in the U.S. when Ch. Warlord of Mazlaine went best in show at Westminster in 1947. The first Boxer was registered in Canada in the Canadian Kennel Club Stud Book for the years 1934-1935 under the breed name Boxer Spaniel. In 1949 the first Boxer club in Australia was formed "The Boxer Club of Australia" it's major interest was in the running of shows. At an early meeting, the Club resolved to donate trophies for Sydney Royal Best of Breed, Best Puppy and Best Limit. At the 1951 Sydney Royal, Boxers had the second largest trophy list after Irish Setters for an entry of 32! Sydney Royal was, and still is, an important show on the Australian Calendar. Boxers were first exhibited at the Sydney Royal in 1949, there were 6 imported dogs shown. 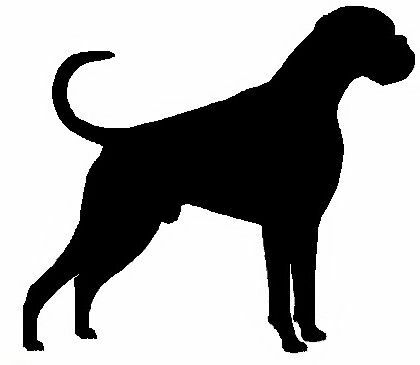 In 1950 20 dogs were exhibited and the first Australian prefix appeared, this was “PARK ROYAL”. The entry at Sydney gradually increased, by 1958 there were 74 dogs entered. Throughout the first decade there was much discussion over the Club’s name. Although when the Club was formed there was no other Boxer Club in Australia, there were areas of dissent. As early as March 1950, the Victorian KC requested the RASKC to eliminate the word “Australia” from the Club’s name. The original name remained however until 1960. In that year, the pressure from controlling State bodies and individual members saw a move to alter the Club’s name. In June 1960 a motion that the word “Australia” be deleted and replaced with “NSW” was received. The motion was defeated by 13 votes to 9. However, In November 1960, the motion was moved again, which was carried unanimously, and the BOXER CLUB OF NSW was born. 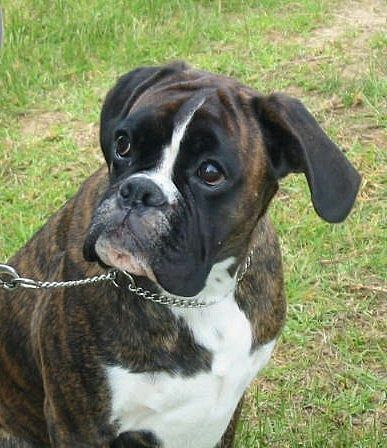 In some countries Boxers are shown with cropped ears as a rule. This practice of cropping ears was introduced during the time when the dog was used for security work and the larger, hanging ear could easily get torn during a fight. 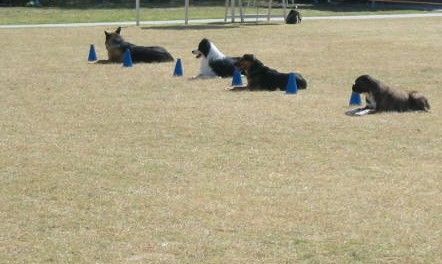 In many countries now ear cropping and tail docking are prohibited by law. Boxer's must be shown with natural ears and tails. This gives the Boxer a different appearance to head, the Boxer's expression and the overall look of the dog. In the early days, Boxers may have been quite ferocious being used for fighting and bull baiting.. Today, the Boxer has been refined as a gentle, loving family companion with a non-aggressive temperament. The Boxer requires socialization and basic obedience training as with any puppy. You don't want your Boxer jumping on people !!!. This breed should have firm and consistent training. The Boxer requires a dominant owner. They respond very well to children and other dogs, but two male Boxer's may be aggressive or territorial towards each other as with other breeds of dogs. A Boxer will go between their family owners and a stranger that looks like an intruder. 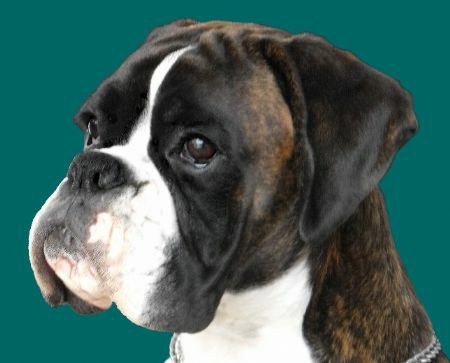 Boxers are happy, high-spirited, playful, curious and energetic, even into old age. They have high intelligence and are eager and quick to learn, although they do have the reputaion of being the 'Clown' of the dog world. They want/need lots of companionship. A fenced yard and daily excersize and play time is needed. The Boxer is considered a 'People Dog' needing human attention. Some of the Boxer's talents include watch dogging, guarding, police work, military work, search & rescue, herding, competitive obedience & agility, schutzhund, fly ball and performing tricks. Boxer's love to please and enjoy playing games such as fetching a ball and tug-o-war. 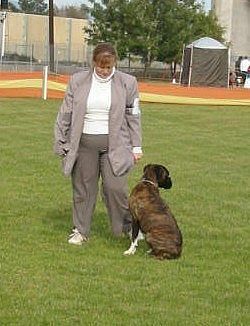 Seeing a Boxer compete in Conformation, Obedience or Performance events is a site to see. Take a trip to a local dog event to see beautiful Boxers in action. 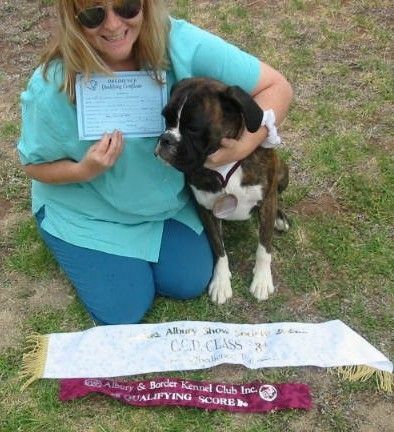 Australian Champion Boxberry Sweet Surrender CCD "Zoe" AKA "Burger"